Price does not include tablet case or cover. School is back in session! Calling all science clubbers, study buddies, and prom queens – ready, set, save! Academic Superstore is here to make sure that you’re at the head of the savings class with great deals on software, teaching aids, training books, and dorm wares. Get smart with an Academic Superstore coupon today and ace your next order with average savings of $15. There’s more to school than backpacks and brown bagging it. The Academic Superstore has done your shopping homework for you and is fully stocked with all things educational. Carrying a wide range of the leading software, Academic Superstore’s roster includes: Microsoft, Adobe, Corel, Wacom, Filemaker, and Quark. To make sure you make the grade offline, Academic Superstore also offers classroom and dorm supplies including: hardware, teaching aids, training books, book bags, calculators, iPods, microwaves, mini-fridges, security, interactive whiteboards and much more. From grade to grad school, both learners and teachers alike agree Academic Superstore is the go-to educational retailer for language, reading, math, music, science, business, and programming – just to pencil in a few. The Academic Superstore got its head start back in 1998, hailing from the capital of creative – Austin, Texas. They have an A+ philosophy and way of doing business, committed to offering innovative products and only hiring amazing people to service their large customer base of schools, students and teachers nationwide. Academic Superstore realizes how expensive quality education can be and offers discounts of up to 85% for non-profit organizations and underprivileged schools as part of their Academic Community program. We give them extra credit for giving back! The mind is terrible thing to waste and here at CouponPal, we believe wasting money is too! We’ve hit the books on deals so you don’t have to. Start shopping smart by bookmarking an Academic Superstore coupon for your order today. Whether you are a science geek, study nerd, or prom queens – get ready to save! Buy academic software, teaching aids, training books, and dorm wares from Academic Superstore Below are instructions on how to use and apply an Academic Superstore coupon code. After locating the coupon or deal you want to use to purchase Academic Superstore items, click the corresponding "Get Deal" button on the Couponpal Website. A new window will pop open when you click on your button. 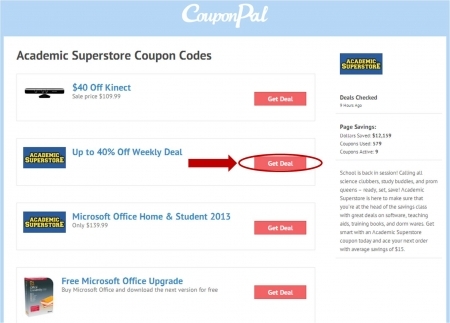 If Couponpal is providing you with a Academic Superstore coupon code, copy and paste from the pop up window. Keep this window open in case you need to come back to it later. If there is no Academic Superstore coupon code, you will skip this step. After you have clicked the Couponpal "Get Deal" button, your window will be redirected to academicsuperstore.com. 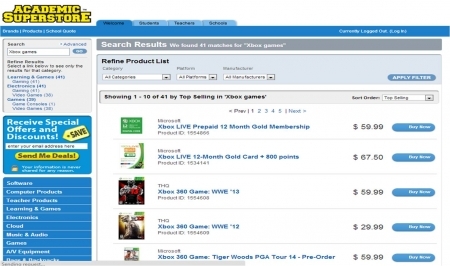 If the exact page you were directed to, is not the exact product page of the promotion you are referencing, click the menus on the left side of the screen to search for your item. Click "Buy Now" to advance with purchase. 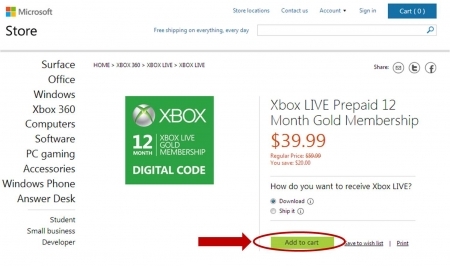 If you are buying software from the Microsoft Store, such as XBox LIVE Prepaid 12 Month Gold Membership, choose to either Download It, or Ship It. Then click "Add to Cart." 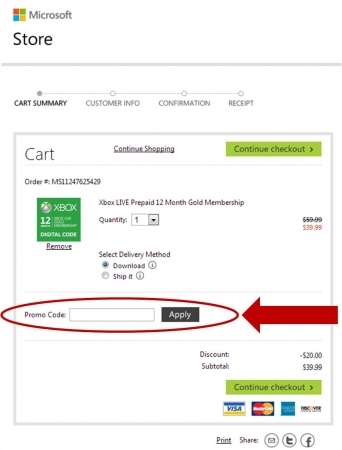 Make sure all the items in your Microsoft shopping cart are correct, then enter your Academic Superstore Promo Code or Microsoft Store Promo Code, then click "Apply." Going to school is hard work. It’s nice that it sometimes pays off in the form of educational discounts. Academic Superstore offers all the software students and teachers need to be successful inside and outside of the classroom. Need help getting your software? Read below to find the answers to some common questions. It’s not cheating! Why won’t my Academic Superstore coupon work? The most common reason for a coupon not to work is that it has already expired. Check the date of expiration and make sure that it hasn’t already passed. Another possibility is that restrictions may apply to the coupon, like a minimum purchase value, or the promo may only apply to certain products. Double-check the coupon restrictions and make sure the coupon code will be valid for your purchase. How can I check Academic Superstore coupon restrictions? On the Academic Superstore page at CouponPal.com, you may see a small “i” or “information” icon in the upper righthand corner of a coupon. Click this to view the restrictions that apply to that coupon. Are the academic versions of the software that I want the same as the regular versions? Yes, the software available at Academic Superstore is the same software you would purchase anywhere else. Some programs may have limited data input or output available in the academic versions. The main difference is the discounted price for students and educators. Can anyone buy software from Academic Superstore? Though the discounts are enticing, only students, teachers, and academic institutions can purchase software from Academic Superstore. Students and teachers from kindergarten through university are eligible to buy software, as well as full-time home-schooled students. How much is shipping? Can I get free shipping from Academic Superstore? Shipping costs depend on where you need your software shipped to and how fast you would like to receive it. You can save on shipping by choosing to download your software directly to your computer instead. Downloads aren’t immediate – they usually take 1-3 days after you make your purchase before they are available. You can find directions for downloading your software here. Can I return software after I’ve bought it? Academic Superstore accepts returns of unopened software within 30 days of delivery, and of hardware items within 14 days. If you open your software and it is defective, you can return it for an exchange of the same product. When you make a return, it may incur a 15% restocking fee. In order to return an item, you need to get an RMA number, which you can do by calling 1-800-817-2347. If you plan to make a return, read this page for the full return policy. Can I share an Academic Superstore deal on your page? At CouponPal, we want to make sure every deal we offer on our pages is valid. For that reason, we currently don’t allow users to post their own coupons. However, we love hearing about deals and discounts! If you find something great that we don’t have on our page, feel free to email us about it at contact@couponpal.com. You can also email us with any ideas or suggestions you have. 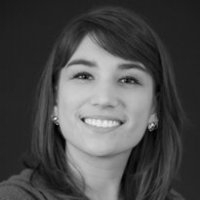 How can I contact Academic Superstore customer service? There are several ways to speak with an Academic Superstore representative You can chat with them online by clicking the “Chat Now” icon. You can also email them at contact@academic superstore.com, or call them at 1-800-904-6933 from 7 AM to 6 PM CST. It’s easy to contact them online by filling out this form. Academic Superstore is the ideal place for any student or teacher. With great deals on software, electronics, and books, you can find everything you need to be top of the class. Not only do they have a huge selection, they also provide their customers with many ways to get schooled in savings. Here are five of our favorite ways to save big at Academic Superstore. One of the best ways to save at Academic Superstore is to sign up for their free newsletters. Their monthly Email Newsletters will let you know about upcoming sales and give you special offers and discounts to use the next time you shop. It’s super easy to sign up--just enter your email address, and you’ll start receiving alerts about sales in no time! Not many people know that companies often offer discounts and special promotions on their Facebook page. All you have to do is “Like” the Academic Superstore Facebook page, and you will be kept up-to-date on great deals like marked-down items or free shipping! One of the most expensive products for students and teachers is the software you need. Items like Adobe Creative Cloud or Microsoft Office can end up costing you a fortune. 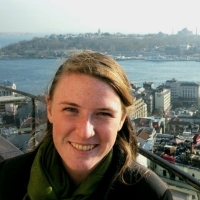 Academic Superstore can help you save your cash--their products are super affordable! Plus, they offer many download-only options, so you don’t even have to wait to have the program shipped to you. Many students and teachers can really benefit from having tablets, but the prices often keep them from purchasing one. Academic Superstore fixes this problem by offering a selection of refurbished tablets. They have brands you love (like Microsoft Surface), so that you can get great quality products at affordable prices. Aside from having special deals or promotions, Academic Superstore basically just has great prices on all of their items! They partner with manufacturers so that they can provide software and other products at amazingly low prices. Plus, when you use your Academic Superstore coupon codes, you can get an A+ for all the savings you’ve earned! By shopping at Academic Superstore you’ll be getting the items you need for great prices. Don’t forget to use your Academic Superstore coupon code--the savings will make you feel even smarter!